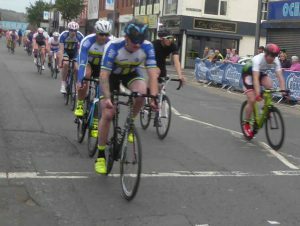 Nearly 150 riders took part in a packed programme of races in Newtownards Town Centre tonight – well up on recent years. First up were the crowd’s favourites – the novices. The 42 riders were split into 4 groups – 3-4 years, 5-6 years, 7-8 years and 9 & over, and raced over 2 laps, with all riders winning a goody bag. In the Under 12 race, the 14 riders completed 4 laps. Aaron Archibald (Ballymoney CC) and Ciara Doherty (VC Glendale) got away, and finished in that order. Caolan McHugh (Four Masters) took the three up sprint for third place. Winning time 7:46. Fifteen riders lined up for the Under 14 race. Rowan Montgomery (Ballymoney) attacked on the first lap and never looked like being caught. He completed the 6 laps in a very impressive 9:18 to take the win. He was chased by Somhairle Owen Fisher (Omagh Wheelers) and Odhra Doogan (Powerhouse). Unfortunately Odhra crashed on the finishing straight, although he bravely remounted to finish. Somhairle took second, and Shea O’Kane (Phoenix) won the sprint from the next group to take third. First unplaced girl was Maia Simmons (The Bike House). The start of the under 16 race. The Under 16 race was much more tactical over the 8 laps (12:15). In the end, Shay Donley (Ballymoney CC) took the win from Ciaran Cahoon (Clan Eireann) and Nathan Keown. Paul Trainor won the A4 race. The seniors and juniors were split into two races. First up were the A4s, competing over 20 minutes plus a lap. Paul Trainor (Phoenix) attached early on, and although the lead never grew much beyond 10 seconds, he just managed to hold on to take a very popular win. David McCamley (Ards CC) took the bunch sprint for the promoting club, with David Zwahlen (Phoenix), David Broome (Dromara) and another Ards CC rider Matt Ormesher rounding out the top 5. Final race of the night was the A*,1,2,3,Jun event, with 33 riders over 40 minutes. The race was enlivened by 3 intermediate sprints after 10, 20 and 30 minutes. The attacks came thick and fast right from the start. 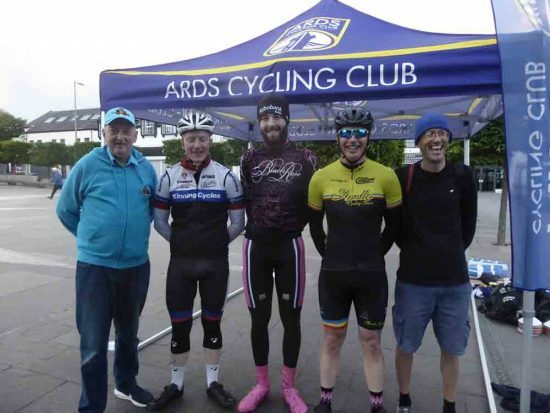 Ian Inglis (Black Rose) took the first sprint from Karl Morgan (Phoenix) and Fergus Rooney (Phoenix), By the second sprint, things had changed, and Glen Kinning (Kinning Cycles) took the sprint from Dominic McCartan (Apollo) and Gary Cranston (Kinning Cycles). 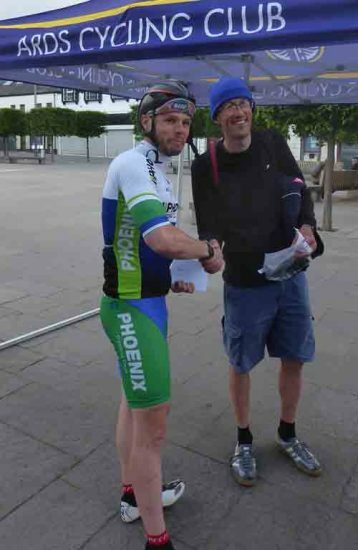 As riders continued to attack and be brought back, it was Ian who eventually made it stick – he took the third sprint, and hung on to take a great win. Glenn and Gary worked hard behind, and Glenn eventually got a gap to take second. Dominic took the the bunch sprint for third from Gary Donaldson (Omagh Wheelers), Brendan Doherty (VC Glendale) and Nathan Mullan (Dromara CC). First unplaced junior was Conor Halvey (Nicholas Roche Development Team) and first unplaced A3 was Mitchell McLaughlin (Planet X). As always, the event would have been impossible without the generous help and support of many people. Here’s a list – apologies if I’ve missed anyone. The club committee, for organising a great night’s racing. The Police, for once again closing the roads. All the marshals, judges, time keepers, sign-on, etc. It was great to see so many folk helping out. St John Ambulance. They had a couple of fallers to clean up this evening – much appreciated. The Council for the barriers and use of the Town Hall. 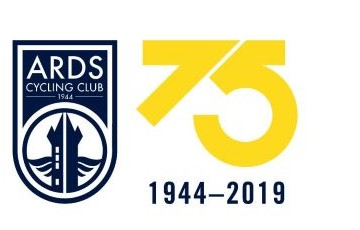 Our photographers – check out the Ards CC Facebook page and the Belgian Project. The sponsors – Chain Reaction Cycles and the Belgian Project.